I believe strongly that humans are omnivores and therefore should eat a little bit of everything and a lot of vegetation. I don’t think veganism is the answer to the worlds ills. People find ways to ruin everthing they over consume. So for me, the solution is to be a considerate eater. Try to know where your food comes from, how it was raised/grown/harvested and by whom. I wonder if vegans are as vigilant about the fair treatment of PEOPLE who pick the crops they consume (e.g. migrant workers, the quinoa troubles, etc.). If these signs at least encourage people to consider less meat or humanely raised animals, then I support them. I am not going to “go vegan”, but being more aware and more considerate of all life (plant and animal) has helped me become a better omnivore. The operate out of California and incorporate the full range of food activism that includes both the exploitation of people and animals and the environment. They are particularly good on information about global commodity crops like chocolate that involves human trafficking and child slave labour. They have lists of ethical products. Being truly vegan is an ethical lifestyle which goes well beyond food. It requires one to adopt a comprehensive world view which is anchored in the concepts of peace, freedom, non-violence, respect for ALL life, and a total rejection of exploitation in all its forms. It is a lifestyle which is both complex and comprehensive, embracing all aspects of ones thoughts and actions. “Eating animals” is criminal, unethical, immoral and constitutes “ecocide”. ” It violates the basic rights of all sentient beings both human and non-human, namely their access to “clean air”, “clean water”, “clean food” and the future sustainability of this planet. “Eating animals” is a preference NOT a basic human right, just like smoking and wearing scented products in public are preferences and not basic human rights. Very important message distilled into the consumption / agony of production binary opposition. 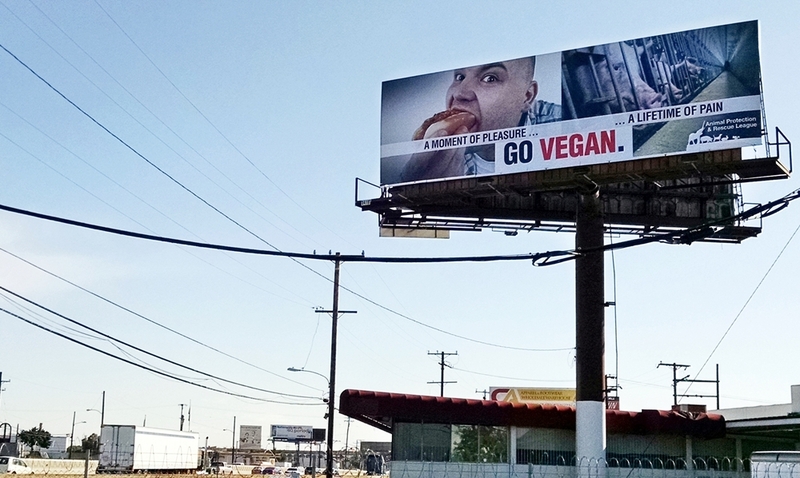 Given that these billboards are targeted at a distracted audience of commuters, I hope the next series will show the aspiration of veganism as fitting within the frenzied postmodern lifestyle and the minimal attention span of the commuter — say show human faces eating deliciously food styled fast food veggie burgers. The message should be: you can still have most of your ecologically destructive consumer lifestyle if you evolve and go vegan. See the earlier post: How to Reverse Climate Change Before It’s Too Late. 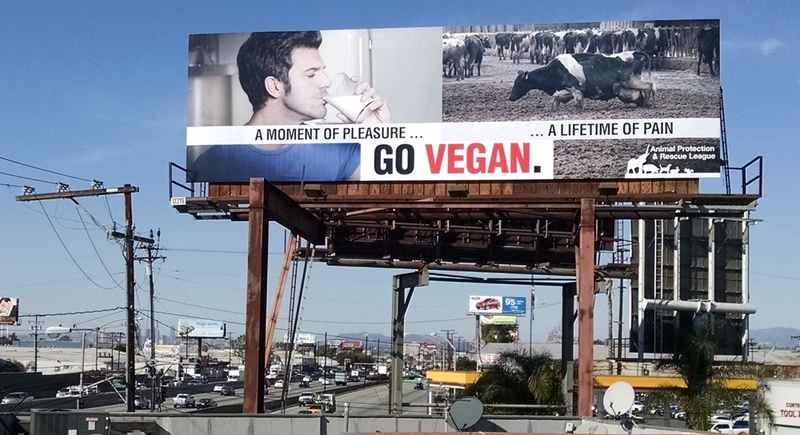 As in I still want my FATBURGER and fries, just hold the BOVINE SUFFERING and make it veggie. CRIFFDOGS too need a makeover. Since MEATONOMIC$ is about the cash money stolen from us all to produce meat I sure wish BigFastfood would discount the veggie burgers to reflect what should be a lower cost of production than the animaltortureburgers absent the federal and local subsidies to meat producers. Maybe we should start a petition? Great idea John! I doubt Subway and Burger King would lower the cost of their veggie burgers/sandwiches, but it would certainly help raise awareness of the cost disparity between animal-based and plant-based products. Times sure are changing. It’s exciting to see the momentum building. This is an approach that is becoming more and more effective as we vegans are finally starting to lose our pariah status and be recognized by the mainstream for our values. Thanks for sharing. This is beyond thrilling for vegans to see. Great Work!! Reblogged this on Vegan Coyote. As John T. Maher points out above. Wouldn’t it be wonderful IF we could get a veggie burger that was cheaper than the torture burgers. Big subsidy on animal products keeps cost lower for the animaltortureburgers. Maybe the veggie burger could be called ‘enviro-burger’ and people who are already on the ‘save the environment’ bandwagon would discover how great the veggie burger actually tastes. Could encourage them to explore vegan foods that are Also very much about environmental protection. Hi Janet – a petition would be a great start!